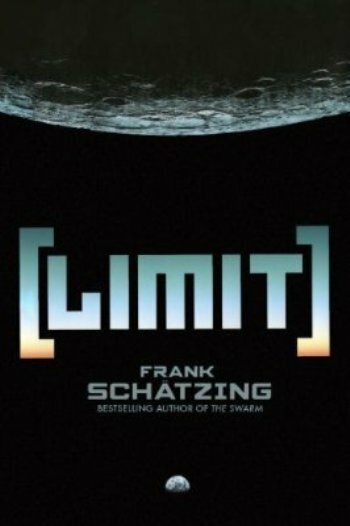 Limit is a 2009 novel by German author Frank Schätzing (who also wrote Der Schwarm). Asian and Nerdy: Granted, Yoyo may not have many nerdy traits, but she is a computer expert. Black Guy Dies First: The first to be killed by The Mole is not only black by ethnicity but his name is Black. Boom, Headshot! : Happens several times during the story. Both Your Head A-Splode and Pretty Little Headshots occur. Bumbling Dad: Julian Orley and Chen Hongbing. China Takes Over the World: China of the year 2025 is much like today, only more Cyber Punk-ish and competing with the USA over helium-3 mining sides on the moon. Cool Car: Owen's one can change colours. Convection Schmonvection: Averted in the beginning near the magma chamber, when characters do notice the searing heat. Corrupt Corporate Executive: While most corporate executives in this story seem to be decent people, some are not. Door Stopper: Over 1000 pages, this book certainly qualifies. Everything Is Big in Texas: Chuck Donoghue fits the rich Texan stereotype to a T, except that he isn't in the oil business. Flying Car: Most notably airbikes. The Great Politics Mess-Up: At one point, an Info Dump is given regarding the oil industry and its slow decline from The Present Day to 2025. The disastrous 2010 oil spill in the Gulf of Mexico would neatly have fitted in there, but alas, it happened one year after the book's publishing. Heroic Albino: Heidrun Ögi. In 2025 a skin cream has been developed which renders her less sensitive to sun light. Inscrutable Oriental: Kenny Xin, though occasionally his stoic facade gets some cracks. Magical Native American: Loreena Keowa, Intrepid Reporter for a magazine called Greenwatch, which covers environmental themes. Her appearance can be described as Pocahontas in a business suit. Mexican Standoff After one of the participants loses her nerves, it ends very bloody. Mohs Scale of Science Fiction Hardness: Hard. Space travel is difficult and expensive; everyone feels radiated extreme heat, etc. Monumental Battle: On the top levels of the Shanghai World Financial Center , in the halls of the Pergamon Museum in Berlin, and in Orley's gigantic moon hotel. The latter gets completely destroyed in the process. Mooks: Kenny has some as his posse. Most of them die. Neo-Africa: Equatorial Guinea is the first African country to launch a rocket into space. No Celebrities Were Harmed: The character of Julian Orley is quite obviously based on Richard Branson. Private Detective: Owen Jericho is hired to find a missing person. Private Military Contractors: Kenny Xin and some other characters have been this in the past. Punch-Clock Villain: When Kenny Xin realizes that his client's cover has been blown and his cause is lost, what does he do? He simply declares their contract to be expired and announces that he will take a holiday. The Revolution Will Not Be Vilified: Averted. Although Julian Orley's plans for revolutionizing the energy industry via the worthwhile mining of helium-3 are portrayed as a generally good thing, the issue of thousands of employees of the oil industry losing their jobs as a result is part of the story. Shout-Out: Julian Orley is an avid Science Fiction fan, resulting in numerous in-universe shout outs to famous Sci-Fi works like 2001: A Space Odyssey and Star Trek within the facilities he built in space and on the moon. The novel has another obvious Shout-Out in Finn O'Keefe being an actor who got famous by playing Perry Rhodan. Space Elevator: The whole premise of the novel is building one of these so the mining will be more economically feasible. You went beyond all limits, Gerald. 20 Minutes into the Future: It takes place in 2025. Schätzing explained in an interview that although 2050 would be more realistic for the technologies portrayed, he considered it more important to immerse the reader in a time in which he or she might still be alive.